Leading Wholesale Supplier of square bars from Ghaziabad. 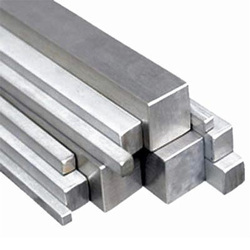 Square Bars offered comes in size options of 5*5mm to 300*300mm or as demanded by the customers. Also available in lengths of up to 12m, these bars come in different surface choices like mill finish, black coated, galvanized, polished, bright and others. Some of its features include suitable for use in production of chemical and shipping containers; suitable for fabrication of heat exchangers, storage tanks; finding use in production of all types of stamping parts; suitable for production of cutting tools, measuring tool and other uses.